PHOENIX -- After weeks of protests by teachers, Arizona Gov. Doug Ducey rolled out a proposal Thursday promising a net 20 percent raise by 2020. The proposal rolled out by the Republican governor Thursday doesn't increase funding for other school needs or provide raises for school staff as a grassroots teachers group demanded. "It's a good day for teachers in Arizona," Ducey said to open a press briefing. Teachers did not immediately react to the proposal. Earlier on Thursday, House Speaker J.D. Mesnard rolled out a proposal to boost teacher pay by 6 percent next year and 24 percent over the next six years, CBS Phoenix affiliate KPHO reports. The speaker hopes this will appease teachers who've threatened to strike if they didn't get an immediate 20 percent pay raise. However, the speaker's plan didn't address all of the demands made by teachers, who have staged "walk-ins" and "sick-outs" across the state as part of the #RedForEd movement. Beyond teacher pay, #RedForEd wants state leaders to increase overall K-12 spending as per-pupil funding remains less than it was ten years ago, KPHO reports. Mesnard's plan takes money away from capital improvements -- like new books, buses, building maintenance -- to fund teacher salaries. Joe Thomas, the president of the Arizona Educators Association, described Mesnard's proposal as a "shell game" that will force schools to make do with outdated equipment and school facilities. "This will pit teachers against air conditioners and that's a false choice for students," Thomas said. Thursday's announcement came after more than a month of protests at the state Capitol and at schools across Arizona that were fueled by teacher discontent in West Virginia and Oklahoma. Arizona teachers are among the lowest paid in the nation. According to the federal Bureau of Labor Statistics, Arizona elementary teachers earned a median wage of $43,280 in 2017 and high school teachers $46,470, the 3rd and 6th lowest in the nation, respectively. Adjusted for local cost of living, federal figures show elementary teachers actually rank 49th in earnings and high school teachers 48th. Under the proposal, average teacher pay would go to over $58,000 by the start of 2020. In addition to the pay bump, Arizona educators were also seeking increased pay for support professionals, a permanent raise structure, and a freeze on corporate tax cuts until per-pupil spending reaches the national average. 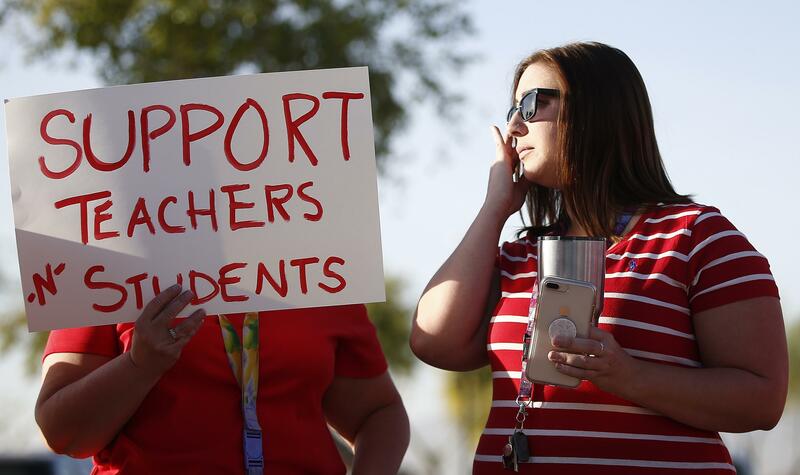 Teachers and others held "walk-ins" at more than 1,000 schools Wednesday to draw attention to their demands and Arizona Educators United said earlier this week that a strike date could be set soon.